Latest DLC including three additional MAN Lion’s City buses available now! 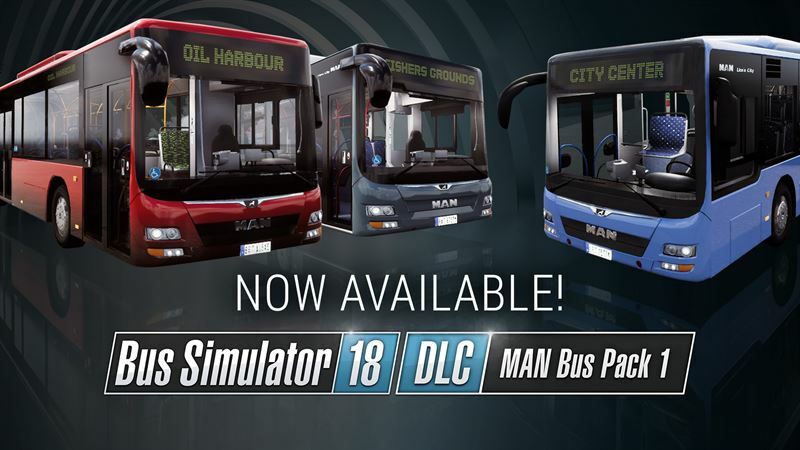 Moenchengladbach/Germany, December 18, 2018 – Following some recently released updates, astragon Entertainment GmbH and the stillalive studios developer team are happy to announce the release of the new MAN Bus Pack 1 DLC for Bus Simulator 18 today. The expansion pack is now available on Steam™ and offers access to three additional city buses of the popular Lion's City series by the German bus and truck manufacturer MAN. With the Bus Simulator 18: MAN Bus Pack 1 DLC ambitious bus drivers and simulation fans can look forward to three official licensed bus models by the popular German manufacturer MAN. While the 10.50 meter long MAN Lion’s City A47 and the 11.98 meter long MAN Lion’s City A21 are ideal for operations in the narrow streets of the Old Town, the 17.98 meter long MAN Lion's City A23 articulated bus is providing plenty of seating options for passengers on the main roads of the fictional European city of Seaside Valley. Just like the other buses in the game, the three new bus models of course are offering faithfully modelled cockpits including a number of individual functions, as well as numerous customizing options, which will offer players the opportunity to individualize these vehicles in terms of color and decals. The Bus Simulator 18: MAN Bus Pack 1 DLC is now available for download on Steam™ at a price of 4.99 Euro, 5.99 USD, 4.49 GBP (RRP). Players who do not own Bus Simulator 18 yet, can buy the main game in retail or as a digital download for 29.99 Euro, 34.99 USD, 26.99 GBP (RRP).